You can find our current tuition and fee costs here: What Does It Cost? Information on financial aid and student loans can be located here: Graduate Financial Aid. A limited number of graduate administrative assistantships, graduate teaching assistantships and graduate research assistantships are available. Graduate Assistantships provide a monthly stipend and a waiver for tuition. Out-of-state residents also receive a waiver for out-of-state fees. Persons interested in applying for a graduate assistantship should also contact the individual department as additional application materials and references may be required. Some departments may also have specific deadlines for assistantship applications. Eligibility for an assistantship requires a student to be fully admitted into his/her desired program and have a current GPA, whether graduate or undergraduate, of 3.0 or higher. Assistants must enroll in at least six (6) graduate credit hours per semester and maintain a cumulative GPA of at least 3.0 for master's level or 3.25 for doctoral level. The following information strives to give you a general overview of the graduate assistantship program at Middle Tennessee State University. If you still have specific questions, contact the College of Graduate Studies at 615-898-2840. All graduate programs have a set number of graduate assistant and although the College of Graduate Studies is the final approving authority for all graduate assistants, each department is responsible for interviewing, selecting, and preparing the paperwork for their graduate assistants. So, what does that mean to you? If you are looking for an assistantship, start with the program that you are majoring in, they make the decision as to who they hire so that's the first place to start. The College of Graduate Studies requires that in order for a graduate student to be eligible to hold an assistantship they must first be fully admitted to a program (no conditional admission), and have a GPA of 3.0 or higher (whether graduate or undergraduate if you are just coming to graduate school). Keep in mind that these are just the requirements for the College of Graduate Studies, each department may have its own requirements that you may need to meet as well. MTSU has three (3) types of assistantships, research, teaching, and administrative. We also offer both master's and Ph.D. assistantships; the master's assistantships are available for both nine (9) months and twelve (12) month contracts and the Ph.D. is available only as a twelve (12) month option. In exchange for working in the department you are given tuition remission at an in-state status, a percentage of your fees, and a modest monthly stipend. Again, the specifics of the contract, award types, amounts, etc. would be discussed with the individual department. As a colleague, graduate assistants are also allowed to upgrade to a faculty/staff parking pass for a nominal fee at the Parking Services Office. Students hired as administrative assistants are required to submit an hourly timesheet to the Human Resources department monthly. Timesheets are located on the HR website. Check with the individual offices regarding availability. The Graduate Teaching Assistantship Certificate Program is designed to provide Graduate Teaching Assistants with a structured experience that prepares them for classroom and laboratory teaching. The program allows you to develop and document your classroom teaching and teacher development activities and it provides you with several self-reflection and consultative feedback opportunities. It also provides several documents that can be included in your professional and teaching portfolio. Students can learn more about this program here: Graduate Teaching Assistantship Certification Program. It Pays to Be Unique! You may qualify for in-state tuition at MTSU if you are enrolled in an academic major not offered in your home state. The Academic Common Market (ACM) is a tuition savings program which allows residents of participating states to qualify for in-state tuition for unique academic majors not offered in their home state. The ACM is coordinated by the Southern Regional Education Board (SREB). *Florida and Texas participate in the ACM at the graduate level only. Which programs are approved for the ACM? Many MTSU programs are already approved for ACM - you can find a list of programs by state here. Other programs may be eligible for approval if they are not currently offered in your home state. 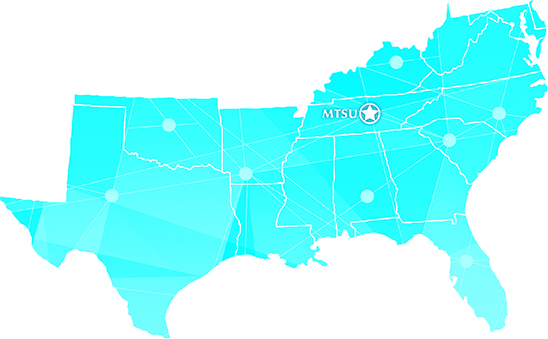 The MTSU Regional Scholars Program allows select non-Tennessee resident students who live within approximately 250 miles to attend MTSU at a reduced rate. Have a documented permanent residence located in a county within a 250 mile radius of MTSU. A reduced tuition rate equal to approximately 44% off the standard out of state rate (instate tuition + roughly $235 per credit hour). Certain students may be eligible for the Academic Common Market Program which offers instate rates. Follow the link for details. Contact the College of Graduate Studies at askgrad@mtsu.edu or 615-898-2840 for more information. There are several scholarships for graduate students available through the College of Graduate Studies. Below you will find information and guidelines for each scholarship. The MTSU Foundation Graduate Scholarship is established through the Senior Gift Program by graduating seniors of MTSU and for the purpose of providing scholarship support to graduate students at Middle Tennessee State University. Recipients are awarded the scholarship dollars for the upcoming fall semester. In order to receive the scholarship dollars for the following spring semester, the recipient is expected to achieve a minimum of a 3.0 GPA in the previous fall semester. Each scholarship is for up to one academic year (fall and spring semesters) and may not be renewed beyond the one year. Preference shall be given to students who participated in the Senior Gift Program before obtaining their undergraduate degree from MTSU. The Samuel H. Howard MBA Scholarship provides assistance to African American students. Scholarship funds may be used for tuition or for the student to participate in the National Black MBA Association, in particular by funding convention attendance. The Tammy Jones Memorial Scholarship is awarded annually to an incoming or current graduate student majoring in mathematics or vocal music at Middle Tennessee State University. This scholarship may be renewed for a maximum of one year. Prior recipients must re-apply for consideration. The Mary W. and Chester R. Martin Graduate Academic Scholarship fosters academic scholarship and leadership. This scholarship is awarded fall and spring semesters as a tuition grant. This award is made for one semester only and is non-renewable. Attach three letters of reference. These letters should contain evidence that the applicant shows exceptional promise for academic excellence and leadership. The Albert L. and Ethel Carver Smith Memorial Scholarship is awarded the student's first semester and is renewable for one additional semester, contingent upon satisfactory academic progress. The Walton O. Warren Graduate Scholarship is awarded annually in an amount determined by the College of Graduate Studies Scholarship Committee and limited to the funds available in the spendable account. The Office of Research offers several avenues to explore for locating both internal and external funding opportunities for faculty and students. Check their website for more information.